@Patrick thanks for that,will make for some fun reading! Regarding the ‘rally’ some suggestions…how about starting the day riding to hounds with the Ward Union,lets hope its not a drag.In fairness the hunting season is over,but pencil that in for the “Fall’.Looks like some of the members,are going to find out what its like to be hunted by a pack of baying dogs,just watch the press turn. Now the skin and blister Gillian Ronan,hopefully will organize a little ‘do’ at her place Town,famously purchased off Treasury! Linked the ST article but behind a pay wall…go away out that Gillian do they,stop no way………………………really ! “I always adored Town Bar and Grill as a customer. Then my brother, Johnny Ronan, of Treasury Holdings, owned it. When it went up for sale last summer, it went out to public bid. Your not the only one Gillian,looks like most of the board in China also striving to do just this ! Check out the deck chairs,looks like they are getting rearranged, Cessation of Appointment,section for directors. Reading it too,but lets demolish one popular myth. “It has 45 employees based in its offices in Dublin.” para 29. @NWL comment stands 45 employees in Dublin/Ireland,can the state hope for some emigrants remittances from Russia or China.. Depressing reading,100 million in new funding and still arguing in November 2011-para 51- about assignment to NAMA of rental income from secured assets. Cut the blood supply off to the patient day ONE,garnish/grab/get assignment of ALL rental income-its101 loan work out,prior to ANY additional funding. Who would have thought that Treasury lost this case with an “own goal”. A wise old lawyer once told me that when litigating “Never give the other side a break that weakens your position”. Having won every significant point in their case, Treasury were found to have done exactly that – and lost. 169. In summary, the conclusions reached on the issues identified in paragraph 15 and determined are as follows. (1) The decision to enforce taken by NAMA on 8th December, 2011, is a decision in the realm of public law, and as such, amendable to judicial review. (2) On the facts herein, in December 2011, Treasury had a right to be heard or, as alternatively put, NAMA was under an obligation to give Treasury an opportunity to be heard prior to taking the decision to enforce. (3) Treasury was not given an opportunity to be heard and heard by NAMA prior to it taking the decision to enforce. (4) NAMA was under a duty to act fairly and reasonably in taking the decision to enforce. Further it was in breach of that obligation by reason of its failure to hear Treasury; its failure to consider a relevant matter, namely, investor interest in the acquisition of the Treasury loans or underlying secured assets and the unfair procedure in the timing of the Credit Committee meting on 6th December, 2011. (i) The standstill agreement was concluded on 11th January 2012. (ii) NAMA entered into the standstill agreement expressly in reliance upon Treasury’s representation or undertaking that should the discussions during the 14-day period not prove to be satisfactory from NAMA’s point of view, that Treasury would not object to the appointment of receivers and that it would not commence any application in that regard seeking to have the Group placed in examinership or any like application. (iii) In reliance on the representation NAMA acted to its detriment in entering into the standstill agreement and committing resources to and incurring expense in evaluating the Hines and Macquarie proposals. (iv) Treasury acquiesced in the ‘ground rules’ set out by NAMA on 12th January, 2012, and participated without objection insofar as it was required to do so in the discussions and evaluation by NAMA of the proposals from Hines and Macquarie during the standstill period. (6) In accordance with the applicable constitutional, public law and equitable principles set out in the judgment and on the finding of facts made, the Court must hold that Treasury is estopped from pursuing its claim herein for the orders of certiorari of the decisions of 8th December, 2011, and 25th January, 2012. (7) If Treasury were not now estopped from pursuing its claim the Court would exercise its discretion against granting orders of certiorari of the decisions of 8th December, 2011, and 25th January, 2012. Having read the judgment for a second time, I’m still in awe of the stupidity that allowed Treasury to lose this having won all salient points. Is the Judge saying what I think that he is saying? – that even if Treasury was not estopped, he (the Judge) would have exercised his discretion and refused Treasury’s application despite the fact that NAMA was in breach of its obligations? @WSTT, I believe the judgment is raising quite a few eyebrows for a number of reasons, and the estoppel point in relation to the standstill agreement might be one of the weakest that may be the subject of the Supreme Court appeal. BTW, Ms Justice Mary Finlay Geoghegan is all woman! Now we don’t know who AIAC is, maybe Anglo Irish Assurance Corporation, maybe some different entity entirely but this revelation in a judgment seems cack-handed and thoughtless on Judge Finlay Geoghegan’s part. @NWL. Mea Culpa. Of course she is. I did not mean to cast doubts on her femininity! I shouldn’t blog so late at light. P.S. Her grammar is atrocious. Switches from plural to singular in the same sentence. I know I do it on some occasions – but have they no editor down in the Four Courts? And if I read Conclusion (7) correctly she is saying that she would rule against her own findings of fact. DAC Beachcroft act for Treasury. Agreed the judgement is actually a great read,Tresaury is a formidable opponent.NAMA should never have gone down the road with “CIM” it was a trojan horse,set a very unfortunate precedent in this case.Also,way too much cloak and daggers stuff by NAMA.They should also stop using emails,excessive phone calls from junior inexperienced staff.In writing or in person when litigation pending or on the horizon,so is NAMA a “public” body then.Very very perplexing case and judgement,no reference or reliance on the commercial reality of the situation,none. The offers are derisory and involve significant loss to the state,with the deadbeat borrower having an ongoing role,ludicrous,ridiculous,the Judge spent too much time on procedural issues,dates,meetings not enough on the fact that the borrower is insolvent and in default on its loans. 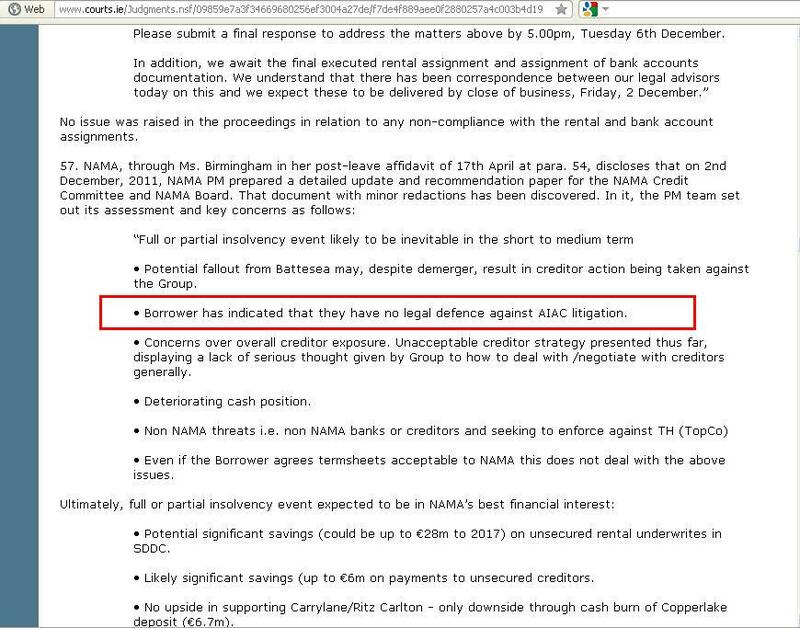 NAMA will prevail here,does anyone think the loans are getting paid at par,that’s a different animal.Tresaury played a crap hand very well,but so what the math does not change. Another big day out……..interesting comparison as KBC is most defiantly not in anyway a ‘public’ company. Numerous references and some confusion in the judgement relating to Ronan,being in NAMA in a separate capacity to Treasury,NAMA has 1.7BILLION loans here,how much could Ronan owe on top of this.Why has NAMA not moved on him in a personal capacity ? 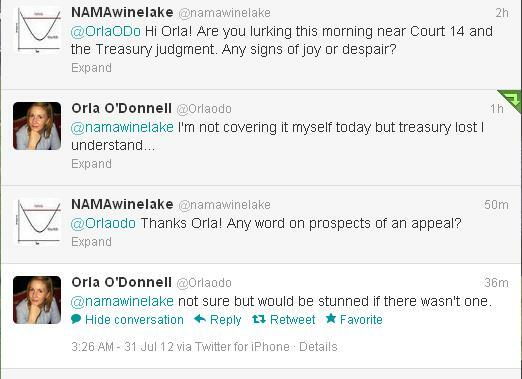 @Patrick, RTE’s Legal Correspondent, Orla O’Donnell, who you can follow on Twitter at @OrlaOdo has tweeted to say that “essentially” the case has been adjourned until 27th August, 2012.